The room was just a bit dark for this photo to properly expose, but it’s a great candid, probably taken a few seconds prior to a serious attempt at a family photo. I look at this image and think, “This was when the Lowry family was still so small!” But then I realize there are six people in this photo and that’s really a large family by today’s standards. 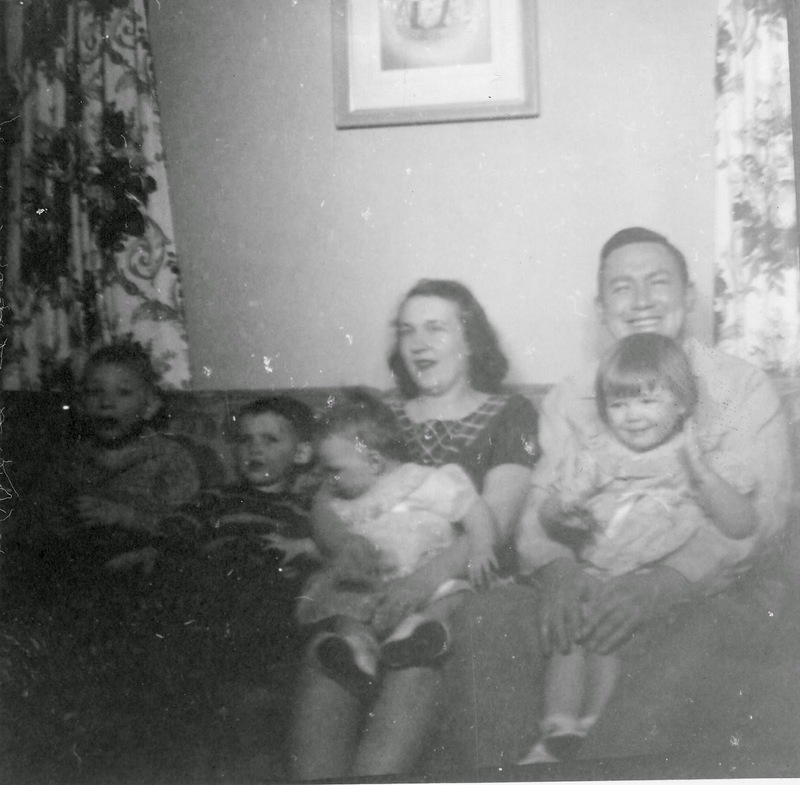 In this image are my grandparents Jean and Chuck Lowry, and their oldest four children, my godfather Chuck Lowry, my dad Pat Lowry, my aunt Mary McCaffrey and my aunt Chris Vath. My aunt Mary is the peanut in this photo and she was born in January 1955, so I place this photo sometime that summer. Charles Lowry (date of birth withheld), Patrick Lowry (date of birth withheld), Mary Lowry McCaffrey (date of birth withheld), Jean Groucutt Lowry (1924-1987), Charles James Lowry (1924-2007), Christine Lowry Vath (date of birth withheld), photograph, taken in Youngstown, Ohio in 1955; digital image, photocopy of original, scanned in 2013 by Joseph Lowry; privately held by Mary McCaffrey, [address for private use], Canton, Ohio. Family of six, including parents, two boys and two girls sitting on couch. Provenance is Charles Lowry to Mary McCaffrey.